The month of April 2017 was particularly special in terms of our search for new cuisines and travel. This month after intensive planning we went on to experience “The Royal Cuisine” food at the palaces of royalties of Madhya Pradesh. The Royal Cuisine Trail began with the a tale of food through the princely state of Limdi. Among the numerous princely states which existed before partition, Limdi held prominence in Gujrat. With Limdi lying very close to Madhya Pradesh, the food habits of the kingdom reflected the cuisines of both the states of MP and Gujarat. We were hosted by Kunwar Shivraj Sinh and his wife at their residence in Indore to gain a first-hand experience on the food of Limdi. To give people an insight into the food of the royal kitchens, the duo of Kunwar Shivraj Sinh Limdi and Kunwarni Vijaya Singh Sirmaur have started Gourmet Royal. The night began with Vegetarian Seekh Kebabs and Maans ke Sule. If you take the consideration of royal food, most of the dishes were born out of need. From recipes created during hunting to dishes prepared which could last them through the drier months. So unlike the popular notion of richness, they also used the fresh produce of the land with changing season and whatever spices were found around. The Maans ke Sule had been given a twist than the original recipe although holding onto the originality. The raw papaya (kacha papita) and kachri (a variety of cucumber) as used to moisten the meat. Also to be noted is that the Kachri gives the meat a bit of sourness. The fusion twist to the soole was the use of Worcestershire sauce giving it further tanginess. The rest of the ingredients were all simple being red chilies, homemade garam masala and garlic. The Maans ke sule were literally melt in the mouth and the perfect start to the evening. The princely state of Limdi in Gujarat was closely related to the Malwa region of Jabua. With Kunwar Shivraj Sinh and Kunwarni Vijaya Singh Sirmaur being cousins, there is a confluence of dishes of both royal cuisines under Gourmet Royal. 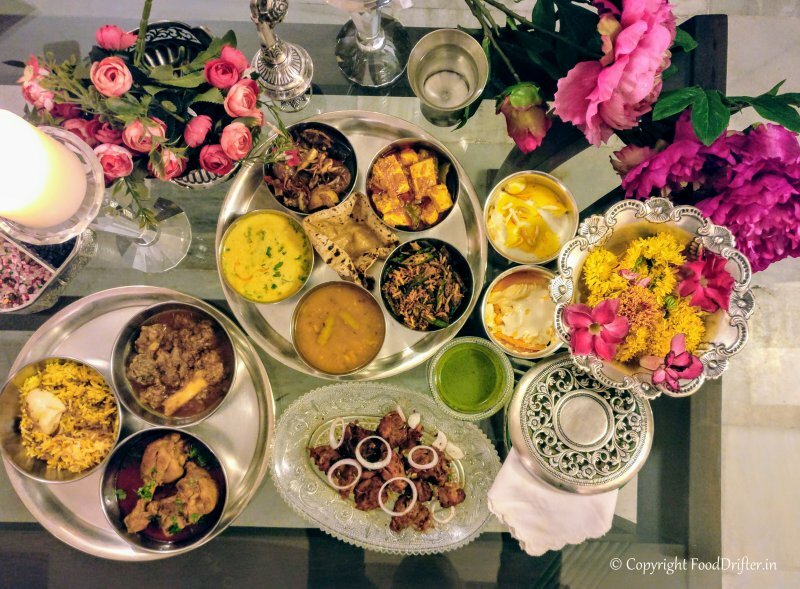 To gain further deep understanding of Royal Cuisines in India, it’s important to note that there was a interlinking by marriage between the princely states. This changed the entire eating habits with the women bringing along their state recipes and integrating them with the kingdoms they’d been married to. For eg. Kunwarni Vijaya Singh Sirmaur’s grandmother was from the kingdom of Nepal married to Jhabua. Thus there are also a lot of Nepali recipes being catered to under the brand of Gourmet Royal. As we progressed on with the main course there were distinct flavors which I could identify. The Limdi Khatti Meethi Dal was beautiful bringing along the flavors of Gujarat. The sourness in the dal came from the lemon (nimbu) while the sweetness from jaggery (gud). It was all about the right balance and went great with plain rice. My favorite among the night was the Kachu Tarkari. It’s a Nepali Vegetable Raita which was especially refreshing to the palate with the use of fresh vegetables. A perfect summer accompaniment to all the other heavy food on the plate. The other vegetarian dishes on the menu included Aloo Do Pyaaza, Baked Veg, Crispy Bhindi (Okra) and smoked Paneer. Now to the non-vegetarian dishes on the menu. The dishes were wonderfully represented with Desi Chicken Curry, Safed Gosht and Keema Pulao. The Desi Chicken Curry is a very simple recipe of country chicken in spices. The stewing of the ingredients gave a superb aroma to the gravy with the chicken being almost fall of the bone. But it was the Safed Gosht which had caught my attention. Now there are multiple variations of the Safed Gosht among the states of MP, Rajasthan and Gujarat. In fact this dish had change in it’s preparation with each home too. The Safed Gosht of Limdi is different from the Rajasthani version with it’s use of cashew paste. The rest of the ingredients which go into making the Safed Gosht are Khus Khus (Poppy Seeds), Lemon Juice and Khadi Hari Mirch Paste (Whole Green Chili Paste). The Safed Gosht tastes phenomenal with roti. The night was full of conversation on food as we were joined for dinner by the royalties of Bhopal, Bhainsrorgarh, Begu and Dhar. The wealth of the information about royal cuisine and history which were discussed that night were impeccable. We finally concluded the exquisite meal with Mango Pudding and Homemade Phirni. I might have been a bit to greedy in reaching out for a second helping of the fabulous mango pudding. It is a delight to know that we can now experience the royal food from the erstwhile princely kingdoms through Gourmet Royal started by Kunwar Shivraj Sinh Limdi and Kunwarni Vijaya Singh Sirmaur.